Today is an exciting day! For me at least...I recently joined The Secret Recipe Club and today is my first reveal! Yesterday was also the Super Bowl (as you probably know) and it was the perfect time to try out a new recipe, especially a dip. 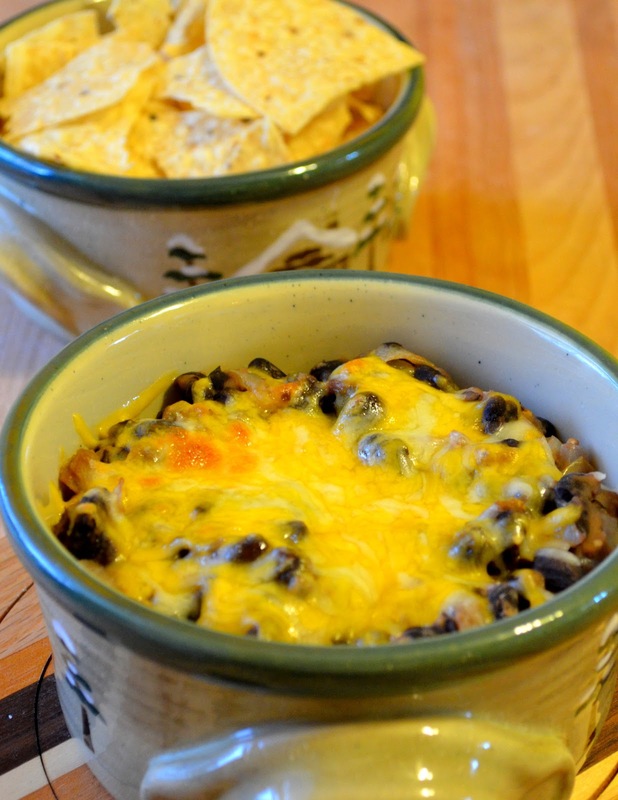 A healthy dip too, with black beans, onions, and a few other ingredients, all topped with delicious and melty cheese! So, we should get to it, yes? This month I was assigned bcmom's kitchen. Anna has a blog that offers a lot of different types of recipes, which is fun because it means more options! I really like a lot of the recipes on her blog. I almost made the Vegetable Oven Pancake instead of the Jack Black Bean Dip but I gave my husband the choice and he chose the dip. I was looking at savory recipes mostly because today is Monday and I usually post a meatless recipe instead of a dessert or bread recipe. But...there were some delicious looking dessert and bread recipes too, like the Peanut Butter Cheesecake Brownie Cups, Eggless Banana Cake with broiled coconut topping, Sourdough Cinnamon Swirl Bake, or Olive Oil Flatbread. She also has categories for breakfast, salad, snacks, and soups that are fun to look through and bookmark for future cooking adventures. I halved the recipe for the Jack Black Bean Dip and changed a few ingredients just a little bit. The original recipe can be found here. I used Evan Williams whiskey, because that's what we had. I also left the amount of garlic the same instead of halving it because I love garlic. Melted cheese on top sounded awesome to me and it was a good decision. 1. Heat oil in a large saucepan then stir in onion and the garlic. 2. Cook the onions and garlic over medium heat until onions are tender, 4-5 minutes. 3. Stir in the black beans, whiskey, and cumin. Then, cook until the dip is bubbly and heated through. Using a wooden spoon, mash the beans slightly, then stir in hot pepper sauce, if using. 4. Put the dip into an ovenproof dish, and sprinkle evenly with the shredded cheese. Broil in the oven for 4-5 minutes or until golden brown and bubbly. Serve warm with tortilla chips and a side of sour cream, avocado, chopped tomato, green onions, cilantro, or jalapeño peppers. Oh, I forgot about that dip - and I even cooked some black beans last week! I just had to try it because my husband loves Jack Daniels. I love your idea of melting cheese on top. I'm doing that next time. 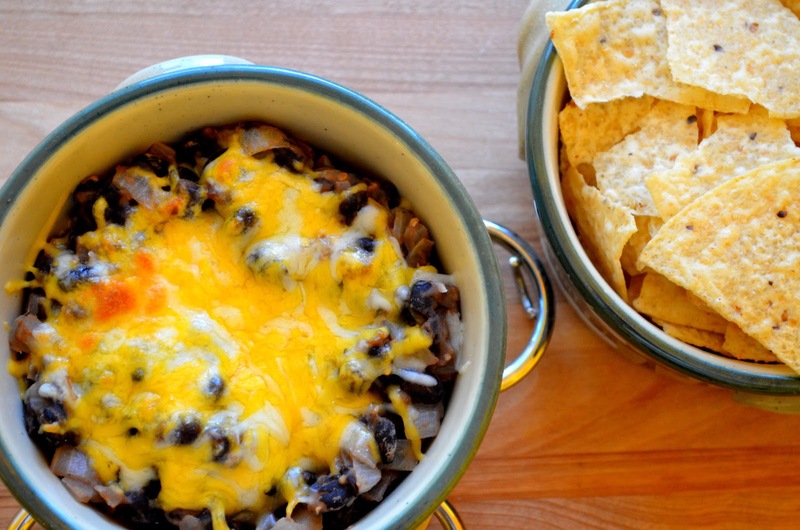 The cheese was really good with the black beans and onions! My husband was a huge fan of this dip. This dip looks great and sounds delish! Great pick! Welcome to the SRC and your dip looks wonderful. Hope that you enjoyed the dip and the game. I wonder if it would be a good taco filling, maybe? I'm always looking for interesting meat-free fillings to serve my vegetarian friends. I think it would be a great taco filling. We had some leftover and made nachos with it and it was awesome! The whiskey flavor really added to it, so I'm sure tacos would be wonderful. Thanks! It's a great recipe. What a great recipe and terrific choice for SRC! Welcome and I hope you enjoyed your first reveal! !